As medical imaging has risen from a radiology-specific concern to an enterprisewide need, hospitals and medical centers have responded to the increasing and broadening demand for images. Making that adjustment is no easy feat, however. Clinicians desire image availability and accessibility wherever they work; making it happen requires scrupulous planning and plenty of hard work. In 2011, the Cleveland Clinic began a multiyear project to make DICOM and non-DICOM images available throughout its entire medical enterprise. The clinic operates 44 buildings on its main campus, 8 regional hospitals, and 18 full-service family health centers throughout northeast Ohio. It also has locations in Florida, Nevada, Toronto, and Abu Dhabi. Louis M. Lannum, director of enterprise imaging at Cleveland Clinic, says even though he knew there were a lot of images, the sheer volume was a surprise. "We understood that there were pockets of imaging, but we didn't know the breadth of the imaging that's being captured outside of radiology and cardiology," Lannum says. "There's [endoscopic] imaging in the ORs [operating rooms]. Clinical photography is part of the wound care program. Point-of-care ultrasound is taking off across a multitude of different departments. So it really wasn't the technology that surprised us; it was how much imaging is out there and how many departments you never thought would have imaging requirements that actually capture imaging content, in some form or another." Lannum says the project began with a vendor-neutral archive (VNA) that was purchased for radiology storage. The planners soon realized, though, that they could create a repository for the entire enterprise by increasing the storage and adding a workflow engine. They began by integrating with departmental systems, such as the OB/GYN PACS, the gastrointestinal endoscopy image management system, and the ophthalmology image management system. Images from those departments and others now flow into the VNA, and users access them through an image viewer that is integrated with the clinic's Epic EMR system. Next, Cleveland Clinic brought point-of-care imaging programs into the system, adding anesthesiology and rheumatology, and point-of-care ultrasounds in the emergency medicine and orthopedics departments. The workflow engine takes orders and schedules from the EMR and provides DICOM modality worklist functionality to departments that did not have it before. As images flow into the VNA, they undergo a normalization process that verifies demographic information and assigns medical record numbers. Once the images are in the VNA, they're accessible throughout the enterprise via the EMR viewer. Lannum says a good governance model is crucial to the success of enterprise imaging. Cleveland Clinic elevated that piece of the project to a top-level priority and created a council with key leaders throughout the enterprise to guide the effort. The council provides oversight, communications, and governance of all projects that are related to enterprise imaging. He adds that identifying people who can champion the cause is essential for obtaining buy-in throughout the organization. Once governance is established, the infrastructure needs to be built, Lannum says. Normalizing unstructured data so they can be stored in the VNA was a big challenge, he says, but the biggest challenge was workflow. Every department needs a process in place to match records with images. "One of the things that radiology has done very, very well is developing standards on naming conventions and orders," Lannum says. "They've developed DICOM modality worklists. They've put a lot of structure around imaging. Outside of radiology, that structure is missing. So what you end up trying to do is create a similar workflow for those departments that previously never had one." Cleveland Clinic is still focusing on getting all images into the VNA; business analytics functionality is not yet available, but Lannum says improving business analytics capabilities is part of the larger enterprise imaging strategy. Like Cleveland Clinic, Sentara Healthcare in Norfolk, Virginia, started out trying to solve a radiology imaging problem, only to find that medical imaging is really a comprehensive enterprise issue. In 2008, Sentara had acquired several hospitals and realized that they needed a process to bring new organizations into their clinical systems. Currently, Sentara operates 12 hospitals, 4 imaging groups, and several outpatient campuses, urgent care centers, and advanced imaging centers. At the beginning of the project Sentara was involved with numerous mergers and acquisitions. Trent Conwell, the IT director for technical services at Sentara, says merging multiple PACS systems can be time consuming, costly, and technologically challenging. Sentara decided that they needed a better strategy for absorbing those PACS systems. They wanted to control costs as well as manage and store images more efficiently. "If you look at each of those issues, radiology departments care about some of them more than others but, by and large, they generally care about each one to varying degrees," Conwell says. "Cost is going to affect their degree of access to images. And because organizations have a tendency to move radiologists among sites, mergers and acquisitions can affect where they will work. But, even beyond that, they generally have a very significant interest in making sure they have access to all images across the entire enterprise and, quite honestly, they would like to go beyond the enterprise to access images." When Sentara started the process, they treated it as though they were purchasing a new software application. They soon discovered that they were actually building a strategy that required multiple components. When they tried to purchase the components they desired, they ran into some difficulty because many vendors were only selling packages of components, rather than single pieces, at the time. As the market evolved, Sentara was able to get the pieces they needed. Conwell says the bigger challenge was getting approval for the components. To do it, his team developed three separate proposals to demonstrate return on investment for each component. The first proposal was for the storage component. Because storage is necessary, it was not difficult to get that piece approved. Another component was an image viewer. Because the image viewer had a great deal of functionality and its value was easily demonstrated, it was not hard to get that approved, either. The most difficult piece to get approval for was the archiving component, a VNA, Conwell says. Because the archive runs in the background, its value was not immediately seen. Conwell says his team was able to demonstrate the VNA's value using basic image lifecycle management rules that save storage space and significantly reduce the overall cost. "When you're dealing with an enterprise imaging platform, so much of what you're spending money on is below the waterline. It's not something that you can really see or touch, and so it's difficult to get the kind of buy-in from key clinical groups that you would get on, for example, an EMR," Conwell says. "It's all about being able to sell, within your organization, the technology and strategy that most people are never going to see." To help put their enterprise imaging plan together, Sentara hired Ascendian Healthcare Consulting. Ascendian helped with the component proposals and the overall strategy. Once Conwell's team got organizational buy-in for the project, Ascendian also helped with choosing the technology. Shawn McKenzie, MPA, president and CEO of Ascendian, says avoiding technology pitfalls requires a lot of homework. Know what you're talking about when you go into discussions about enterprise imaging. It's not as easy as it sounds. It's a lot more complicated and there are a lot more spinning gears than people realize," McKenzie says. "Many vendors say they have a VNA now, but you really need to educate yourself about these technologies. Vet out what's real and what's not real in this space." With their strategy and components in place, Sentara is planning to branch out. Conwell says Sentara is in the process of developing a health information exchange (HIE) that reaches beyond its enterprise. He expects it to be functional in 12 to 18 months. Although medical imaging is increasingly being treated as an enterprise or HIE initiative, radiologists still have a vital role to play in how medical images are distributed, interpreted, and used in a coordinated care environment. McKenzie says radiologists should actively contribute to the decisions around selecting an enterprise imaging technology, specifically as it relates to the images flowing from VNAs to workflow engines and into diagnostic viewers. Otherwise, people outside of imaging will make unilateral decisions that will directly affect the productivity of radiology. "When you try to move radiologists from a PACS that has been designed for functionality around radiology to an enterprise imaging strategy that has additional capabilities, you'd better engage them in the enterprise solution because it may look and feel different," McKenzie says. "If you're moving to a technology solution that is going to break silos and create more enterprising capabilities, you have to engage a wider group of clinicians from multiple disciplines because their buy-in is really where the rubber meets the road." McKenzie says radiologists can provide many benefits to the enterprise imaging process by proactively engaging in radiology-specific enterprise initiatives, such as dose monitoring across the organization and helping to develop clinical decision support based on dose-related exposure thresholds. "I think one of the first things about an enterprise imaging strategy is that you have to think bigger than radiology," says Cheryl Petersilge, MD, a clinical professor of radiology at Cleveland Clinic Lerner College of Medicine Case Western Reserve University. "I think it's really important for radiologists to embrace the new way of thinking in this new value-based world." Rather than fighting the loss of exams, such as ultrasound, to other service lines, Petersilge says radiologists should understand that the value of images lies in their informatics value. She points out that radiologists are the experts on developing systems with orders, reporting, descriptors, associating demographics, and metadata management for images, and they can extend that value beyond the images they generate. If they don't, they run the risk of being marginalized. Petersilge recommends that radiology departments make sure they have a seat at the table when technology decisions are being made. She says imagers can provide valuable insight into what will work best for the enterprise and how to integrate images with the archive. She says it's also important to be part of a physician advisory group that comprises all imaging users and considers the needs of departments that produce and use images. That way, radiologists can find out from referring physicians—their customers—what the referrers' needs are. 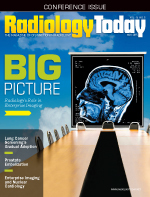 Perhaps the biggest step that radiology can take to promote enterprise imaging and demonstrate value, though, is to integrate its images with the EMR, Petersilge says. Not all radiology departments distribute images in a way that makes them available to the entire enterprise because they don't consider images to be as important as reports. Petersilge says images and reports should be linked. An example she cites is a layperson looking at the Mona Lisa: On its own, the painting may seem beautiful, but most people don't know its history; a description explaining some of the symbolism in the painting can be very helpful. On the other hand, a description without the painting won't provide a complete impression. When the two are combined, however, they are more effective. "I believe, eventually, [radiologists] will see the value of having their images integrated into the EMR," Petersilge says. "We have even found that patients report being more engaged with their disease process and with their care when there's an image to go along with their diagnosis."